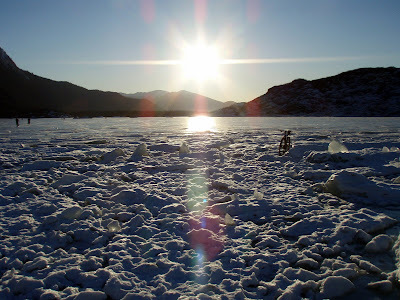 How many hours of daylight do you have on your shortest day of the year? I should have included that. It's six hours, 23 minutes here in Juneau. They get about five and a half hours of daylight in Anchorage, about 3:45 in Fairbanks, and about six weeks of total darkness in Barrow, so where you are in Alaska makes a big difference. One aspect of Alaska living that's never hit me too hard is winter darkness. My work schedule allows me to get out for hours in the daylight every day, which helps a lot in warding off seasonal affective disorder. Lack of sun caused by days on end of rain, however, is another story. 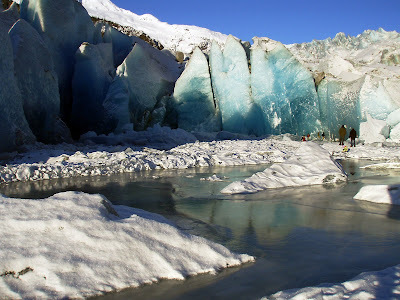 Wow, the blue in the glaciers is just amazing. Definitely something that I'd like to see. "The coming of the light." Think about it. Great post. Happy Holidays from St. Paul, MN. Hi Jill, do you ever surprise the heck out of non-locals when you ride up to them on a bike when they think they are out in the middle of nowhere? Their expression must be priceless! Anyway, I love you blog, you are an inspiration and a great story teller. Good luck on your upcoming training and Iditabike. Amen! And Happy Solstice to you, too! Funny, as I grow older (mid-40s now), I find the 21st of December to be a joyous day. This is in marked contrast to the now morose feeling I get on the 21st of June every year. Sun all day. Quite an event. Lots of time to ride your bike. 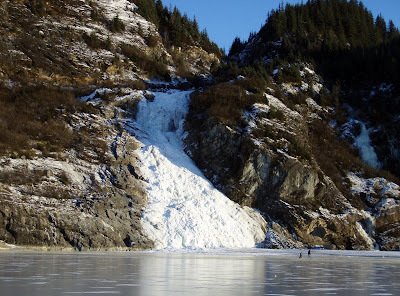 when i lived there the glacier ice came down further to mendenhall lake, like all the way to the water. global warming. 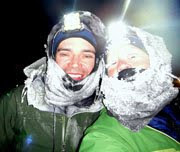 i climbed up through the broken ice fall and just as we got to the top a huge house sized block cut out beneath us. 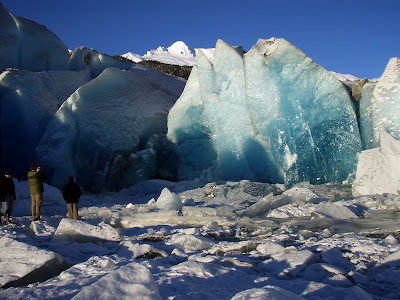 the glacier is like a sea with 40 foot waves that froze suddenly. we also saw a mermaid frozen in one of the seracs, if you give me 400$ i'll tell you where it is. if you know the magic word the ice will melt around her and she will come back to life. Yay Solstice! We made it! Happy Solstice! Here comes the sun! The glacier is so beautiful! Happy Solstice! The pictures are quite stunning ! Thanks for sharing. "They know the real reason why nearly every major culture in the Northern Hemisphere saves its biggest celebration for this time of year. The coming of the light."